The presents under the tree have all been opened and 2011 is just a memory. No one is more surprised to see the dawn of 2012 than Iris, who is 106 years old. The daily realities of modern life amaze her. Hunter came to visit her on New Year's Day. She met us in the lobby of her apartment complex where he opened the baby grand piano and played three numbers for her. The ones that play concerts and the ones that are useful. There are a lucky few who are both soloists and accompanists, and I hope Hunter can be both. I hope he learns to sight read hymns and to listen to vocalists as he plays the piano. His music will help the singer be a Star. The singing Star could not shine as brightly without the shadow of accompaniment. A useful pianist needs a kind heart and a humble spirit. A concert pianist needs to be precise, well practiced, and confident. At least once in a while, I hope Hunter finds an appreciative audience and lifts the spirits of those who quietly listen to him play the piano. He did that on New Year's Day. We gathered, when he was finished, in Iris's apartment, where we watched the Minnesota Vikings lose to the Chicago Bears. We were watching Jim Kleinsasser play his last professional football game. He retired from the Minnesota Vikings after 13 seasons. We first met Jim as a teenage boy who threw the shot put at area track meets. Our daughter, Katie was a thrower at some of the track meets. We knew Jim Kleinsasser was special, even then. Hunter has been a Kleinsasser fan his entire life. We followed Jim's career though college at our alma mater, the University of North Dakota. We have kept our eye on the Vikings #40 for thirteen seasons. Everyone here in GriggsDakota is very proud of this farm boy from Greater Dakota, and we will miss him. 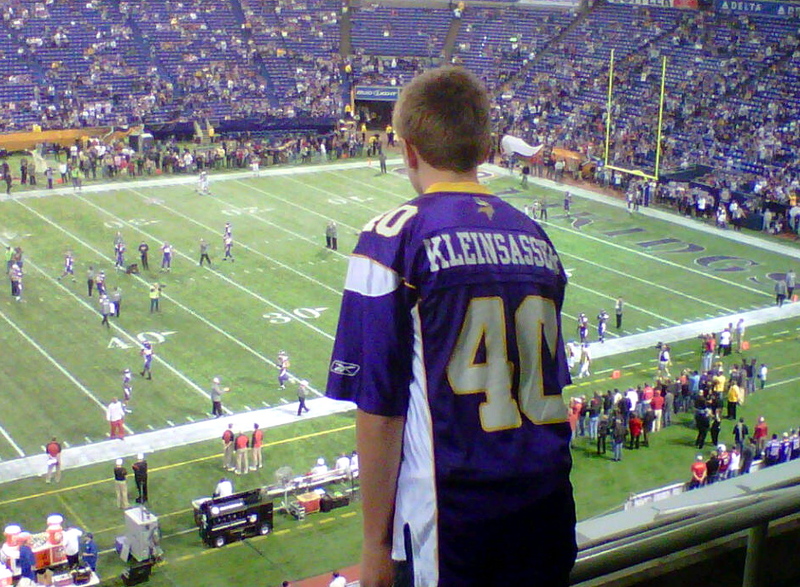 There are big dreams in our boy, as he watches Jim Kleinsasser play his first game in 2012 and his last game as a Minnesota Viking. for anyone who pursues a dream in 2012.